The 4th of October is a special animal recognition day. This is a day set aside to honor all types of animals across the world; and to also honor all the people who love and respect animals. 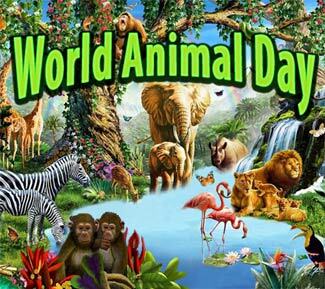 Let’s all participate in the World Animal Day celebration! There are millions of amazingly wonderful animals and their presence on this beautiful planet enriches our human experience as we journey through life. World Animal Day started in Florence in 1931, at a convention of ecologists with the original intent to bring attention to endangered or threatened species. The date October 4th was chosen because it is a feast day in honor of Francis of Assisi, who is a historically notable nature lover and patron saint of animals and the environment. This special day is celebrated in many different ways in every country. Today the celebration and recognition of animals has no regard to nationality, political ideology, religion, or faith. This celebration does not represent any person, organization, or campaign but rather belongs to all of us, everywhere. Churches, synagogues and independent Animal Chaplains hold blessings in parks and fields, while Zoos and other organizations celebrate with simply sharing and recognition. World Animal Day gives all of us a chance to focus on our individual pets as well as other animals. It’s a day for unity and to help spread animal education. It’s a day to help raise awareness of all animal issues that exist throughout the world. Today let’s join the world in celebration and begin a journey of increased animal awareness. Start today to learn more about animals, and then about the plight of animals in our modern world. Learn about the species whose survival is threatened, what’s causing the threats, and what can be done. Join others to help keep animals well, and to help improve the standards of animal welfare around the world. Each of us can do something special to highlight the importance of animals in the world; and honor those who dedicate their lives to animals. Make animals a part of your conversations. Share what you know about animals. Start by discussing your favorite pets, but expand into animals you’ve seen on a walk in nature, in zoos, aquariums or reserves, or that you’ve simply seen on television. Expand your knowledge about animals; it’s an exciting adventure! Take some time to learn about a species that you are aware of, but don’t know much about. Reading is a great way to do this because you’ll get in-depth information and you can see pictures and illustrations too. There are many excellent books available as well as great websites like Animal-World.com to help broaden your horizons. Just don’t be surprised if you find yourself discovering even more interesting animals. Find the benefits of animals in nature, and share them! Try topics like bees cross-pollinating our flowers resulting in important foods, or the different types of predation that keeps the natural world in balance. Share the wonderful aspects of animal ownership on all levels. You can help dispel the negatively held beliefs about specific breeds and animals. Discuss children connecting to the animal world with that first lizard, or the invaluable benefits to the disabled and elderly that an assortment of small animals that can add like a bunny, small singing finch, or a small lap dog! Make your outdoor home environment animal friendly. You can put up bird feeders and birdbaths. You can also plant flowers that attract helpful insects like butterflies, bees and ladybugs. Visit an animal shelter, veterinarian, animal charity, or animal rehabilitation center. Find out what types of problems animals in your area face, both domestic and wild animals. Find out what solutions are available. Learn about strays and pet adoption options. Also learn about endangered species around your community or in your state. Monetary donations as well as product donations are always welcome at shelters and animal care facilities. Just be sure to check with them first so you can provide items they can use. Volunteering is a great way to get involved. There are many types of animal care facilities that welcome volunteers. Shelters and charities are the no-brainers followed by zoos and living museum type facilities. But think outside the box, because any facility that provides care for animals will often welcome help including pet stores, veterinarians, animal boarding facilities, retirement homes, and even schools.